Swisher Sweets Filtered Cigars are famous for their easy and consistent burn, packed with special blends of premium tobaccos that have been infused with a unique flavors to bring you a smoke that is smooth, mild and aromatic. Swisher Sweets Filtered Cigars are created by Swisher International, one of the largest cigar manufacturers in the world. Located in the United States, these premium filtered cigars combine the finest tobaccos sourced from both inside and outside our borders. 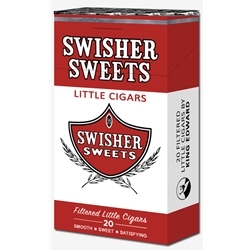 Swisher Sweets Filtered Cigars are distributed nationwide by Swisher International. Each of these discount filtered cigars are available at our online tobacco store in unique styles to choose from. Cherry, Menthol, Regular, Silver, and Smooth (Lights). Choosing Swisher Sweets Filtered Cigars is a great alternative to expensive and over-priced retail brands. Here at Smokers Discounts we’ve made it easy and affordable to buy filtered cigars online. Call us for more details!